Steel Steel thickness averages 5 ml on the hulL, 6 on and 8mm on keel plate. 5mm deck. TWO OWNERS ONLY. EXTREMELY STRONG AND COMFORTABLE CRUISING BOAT DESIGNED FOR EXTREME SAILING IN ANY LATITUDES. 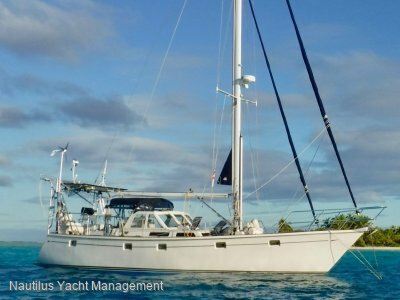 A VERITABLE SHIP, THIS VESSEL IS PRESENTED IN TURN-KEY CONDITION, WITH FULL SURVEY REPORT AVAILABLE END OF JULY 2018, PRE-PAID BERTH AND DRY STORAGE UNTIL MAY 2019, AND WITH CRUISING PERMIT IN FIJI WATERS EXTENDABLE TO 2020. PLEASE INQUIRE FOR FULL BROCHURE AND INVENTORY AS SPACE LIMITED ON THIS WEBSITE. MORE PHOTOS AVAILABLE ON OUR WEBSITE. Nautilus Yacht Management is proud to present 'Llyr', a Roberts sloop built in Estonia and Riga, Latvia 2000 to 2001 as the personal vessel of American NOAA benthic mapper, Captain Ben Smith. This heavy displacement vessel is a modified Bruce Roberts 45' steel ketch that is 53' in length overall, 16' beam, full keel with skeg rudder, and 28 tons. 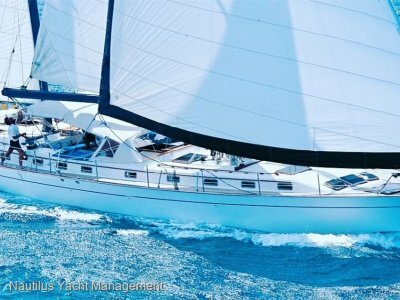 "Rugged"is the most typical comment by mariners viewing RV Llyr's steel hull, high freeboard, sturdy spars and rigging: inspiring lines and "mighty" beauty that draw from strength. Then follow exclamations of how roomy and bright her interior is when they go below and find how a 16' beam and high freeboard open up 9' of clearance in the interior cockpit/salon/galley paneled in sunny white Baltic birch with teak trim; 27 windows and 7 Moonlight hatches, plenty of headroom and no tight squeezes moving fore or aft. Further comments of appreciation are for her elegant compound round-chined hull, roomy walk-in engine room housing a Perkins/Sabre M90, over-built rugged and beautiful custom storm sails personally designed with Dimension Polyant by Doyle Sail's senior vice president, extended fuel range, and robust mechanical and electronic components more typical of larger commercial vessels. RV Llyr is currently in prime condition, carefully maintained with full fuel tanks and state-of- the-art sails ready to sail right now from Fiji, the hub of South Pacific cruising grounds, for the next adventure. 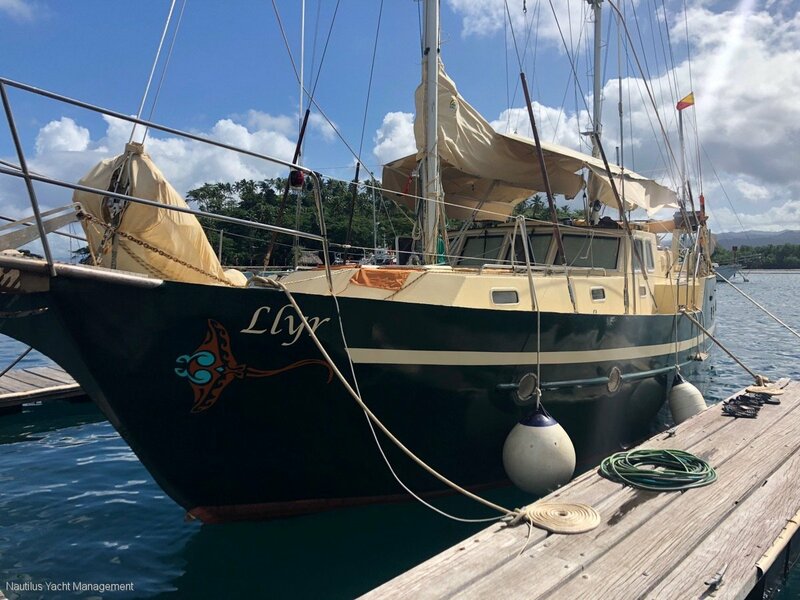 The owners, marine scientists and directors of the well known NGO Island Reach, had chosen her as a safe, beautifully built and maintained vessel to carry out their expeditions from the USA to Vanuatu. This vessel is designed for being self-sufficient for long periods of time even with a large crew of scientists on board. At home in the Arctic as much as in the tropics thanks to her fully insulated hull, abundant natural lightning and cross-ventilation, she is cool under the hot sun and warm in the high latitudes. Inside, her spacious and bright interior is quite remarkable and can easily be compared to a much larger boat. 'For seven years Research Vessel 'Llyr' has given our family and team a rugged, reliable and generous platform for blue-water adventures beyond count', says the owner. 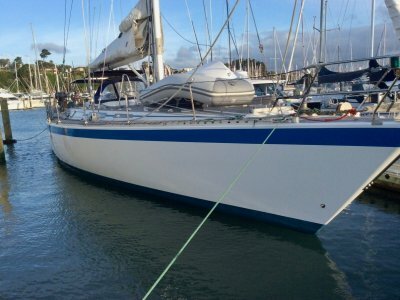 'Below we'll go over her systems in detail and, with supporting video, website, and conversation assist you, as Captain Ben Smith did so kindly for us in 2010, in determining if this rugged, uniquely safe and proven steel vessel might be a right match for you, your loved ones or team and your next adventures! HULL DETAILS: Llyr's elegant round-chined hull is a sweep of compound curves, hand hammered mild steel that draws admiration from those who understand metal boats and this fading construction art. Construction at Hop Tai yard incorporated external adjustable shaping frames, wedges and heavy sledges wielded by teams of shipwrights. She is a significantly modified Spray design. Steel thickness averages 5 ml on the hull growing to 6 on her full keel and 8mm on her keel plate (4 to 5ml on deck). The large rudder is skegg designed and therefore flush to the even keel so that both propeller and vessel are fully shielded from rope snags and blunt impacts. Her shallow draft of 5.5 feet and smooth keel is precisely designed to suit expeditionary island life where atolls often offer fast-water, shallow tidal passes and plenty of rock obstacles. Anchorages in lagoons can snug to the shore as desired to dodge wind or wrapping swell or coral bomies that might damage a bolt-on fin-keel with deeper draft or exposed prop. Llyr's framing, her iron intercostals, are set close in a tight grid that renders her hull stiff. Her ballast is iron embedded in cement and behind all her interior walls the hull is coated with fire resistant urethane foam. Ultrasound confirms Llyr's ballast is stable. You can see on inspection this important feature has blocked any significant rust in hard to reach areas behind walls and tankage, insulates Llyr's interior against both the sun's heat or winter's cold, and renders her quiet to wave action and outside noise. When her owners acquired Llyr in 2011, they went through her entire inner hull below this foam line removing all superficial rust and scale and sealing the metal with a two-pack urethane. Llyr comes with a high quality ($1600usd) Defelsko Positector UTG ultrasound instrument-- certified & factory calibrated in 2017-- with a precision corrosion head that you can use to monitor hull thickness from the inside or out. From her large stainless chain-plates welded to the deck to robust wire sizes and numerous stays and shrouds Llyr is considered by riggers overbuilt for strength. Her mast and spars are of high quality and condition, large winches are Anderson and Harkin. A new Harken MKIV furler+stay system was installed for her new genoa headsail as well as a large customized Forespar spinnaker pole and tackle for downwind sailing. In 2011 all of her 7 Moonlight hatches were replaced. Also installed are hatch safety bars, lazarette bars and locks. Her 10 generous custom acrylic cockpit windows were replaced with well known Diamond Sea Glaze 3/4" tempered storm-glass and all 27 windows on board were serviced. Running rigging is regularly updated, along with blocks and rope clutches, and RV Llyr carries a large supply of backup rode. The vessel's high freeboard, large center cockpit and dual steering stations create safe operating spaces. (The owners recall: 'we can count on one hand bits of side waves that have slopped onto the stern deck over seven years. ) The center cockpit floor is thoughtfully designed for removal allowing for vertical lifting of the engine if ever required for future servicing. Llyr's foredeck has a broad, open and raised design that allows for both the easy shedding of waves as well as numerous work projects, people or gear to haul. At her stern there are four deep lazzaretts that house dive equipement for 6 [owners are supplying 2 tanks and 2+ full dive kits and materials from their sponsor Aqualung USA), compressor, spare ropes, Viking Rescue 8 man Life Raft, Honda generator, heavy charge cables, 6 x 20 liter cans of gasoline, 2 propane tanks, fishing gear and chain etc. Forward, her generous dual hatch chain locker houses gear for Llyr's four anchors, hydraulic windlass, G4 5/16 chain as well as a complete complement of spare sails, 18' Paratech parachute and over 400 meters of heavy thimbled double braight rope for deepwater anchoring or Parachute bridle. Llyr's strong aft davits hold her 12.5' Defender First Responder, hypalon inflatable with a 20hp Tohatsu four stroke engine and Racor 120R-RAC fuel separator. With a rigid aluminum floor and inflatable keel the tender planes, moves fast and can field 4 divers and a driver or 8+ persons. When underway the tender lifts onto Llyr's heavy steel davits. Also stored there are her Fortress stern anchor, 6 UN military diesel cans and five cans of backup water. Llyr's broad decks have often hauled everything from lumber, massive water tanks (one delivery included 11 x 1100 liter tanks, lumber and hardware!) and cyclone relief materials as well as hosted dozens of conservation workers and divers with lots of room to work, sleep, string a hammock, and play. SAILS: The owners recall: 'When we began to refit Llyr in Kittery Maine and Salem, Massachusetts in 2011 we did not know we were close to renowned Doyle Sail international headquarters. Doyle's chief Vice President, Chris Howe found us by chance and was inspired by our farm family's ridge-to-reef conservation mission and so took us on as one of his projects with later company sponsorship. 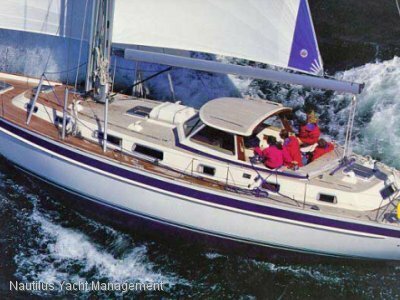 An avid racing competitor, Chris' goals for Llyr as a rugged blue-water cruiser was to give her as much sail horsepower as possible and build demonstration cruiser sails that were storm tough. To be blunt, Llyr's four primary ketch rigged sails are noteworthy works of art! Chris used a cream colored German dacron, Dimension Polyant (450ap & 410ap) that is heat sized, using hot rollers (no spray adhesives), to lock the warp and weft, and includes strong UV inhibitors. The fabric is stiff and remarkably slow to age. He added reinforcement after reinforcement at load points, and along seams used adhesive tapes alongside triple stitching in a dark brown decorative thread. He put extensive battens in the mizzen, main and staysail that flatten the sails and dramatically tighten Llyr's angle of attack to windward. If you come to Vuda Marina to inspect Llyr you will simply not see another stronger set of sails, all in excellent condition as the fabric is extremely resistant to wear and solar exposure. Alongside her hull, and engine, and roomy bright interior, Llyr's sails are matters of conversation and admiration. In addition, onboard there is a full backup set of white traditional weight and cut sails, and a rubberized orange storm staysail, all in excellent condition and never used. They store forward in a generous chain locker along with a "Code Zero" or Universal Power Sail with an ATN sock and Spectra lines we acquired for deployment in light winds (This sail does require a repair to it's head). ENGINE: Captain Smith funded the vessel's construction with a family inheritance. With his extensive experience as a NOAA ship's captain, he fulfilled his wish list with strong, proven equipment. Llyr's engine is a Perkins/Sabre M90 4 cylinder naturally aspirated diesel, (output at shaft 80hp) a heavy engine renown for durability and minimal maintenance. The engine is housed in a generous walk-in engine room making for easy access and maintenance. She has always fired on first rotation and burns zero oil. Her transmission is an oversized Hurth HSW 450-A2 connected to a high-end Aquadrive coupling that dampens vibration and wear. The owners have confirmed with a designer that her brass propeller is precisely matched for efficiency in size and pitch to both engine and boat size/length. In 2011 they replaced her European drive shaft with one turned at Rose's Marine in Gloucester, Mass. Full keel with iron ballast embedded in cement. Ultrasound tested and is stable. Captain Smith funded the vessel's construction with a family inheritance. With his extensive experience as a NOAA ship's captain, he fulfilled his wish list with strong, proven equipment. Llyr's engine is a Perkins/Sabre M90 4 cylinder naturally aspirated diesel, (output at shaft 80hp) a heavy engine renown for durability and minimal maintenance. The engine is housed in a generous walk-in engine room making for easy access and maintenance. She has always fired on first rotation and burns zero oil. Her transmission is an oversized Hurth HSW 450-A2 connected to a high-end Aquadrive coupling that dampens vibration and wear. The owners have confirmed with a designer that her brass propeller is precisely matched for efficiency in size and pitch to both engine and boat size/length. In 2011 they replaced her European drive shaft with one turned at Rose's Marine in Gloucester, Mass. Last year when changing out her cutlass bearing they also replaced her oil-bath stuffing box with a state of the art PSS dripless carbon/stainless shaft seal (stuffing box)--no leaks and runs cool to the touch. (At the same time they swapped out the shaft cutlass bearing behind the prop--standard maintenance) The engine has a high output (100amp) alternator (she carries a spare new backup 100 amp alternator) and three raw water coolers for coolant, engine oil and transmission. Like everything on a Perkins, these Sabre coolers are made rugged with thick pipes. Rpm1800 to 2100, RV Llyr burns 3 to 4L / hour @6 knots. 1347nm range. Max hull speed 9 knots. 7 knots engine speed. 20hp Tohatsu four stroke engine and Racor 120R-RAC fuel separator. Those entering Llyr's cabin for the first time tend to remark on the unusual spaciousness of her high ceilings and wide beam and how bright the interior is with white Baltic birch panels trimmed with teak along with 7 Moonlight hatches and 21 windows and ports! With her interior cockpit integrated with the salon Llyr measures 9+ feet from sole to cabin top where seven cockpit windows with new tan sun screens throw warm light below. The sole is panels of teak veneer with blond piping. Forward cabins are plush double berth V's with desks and clever folding chairs. The owners added a removable bunk to the starboard cabin allowing Llyr to sleep 9 (They have often hosted many more on-board for the night). There are two generous heads with waterproof shower floors, forward is electric and aft is manual. Two Scandvick sink faucets double as showers and all drains to teak grill pans. All hot and cold plumbing is Whale 15mm with SS screens throughout. There's plenty of room in the heads for storage or to hang dive gear. New low draw fans are all about and Llyr's insulated hull shields the vessel interior from the midday sun. There is a larger navigation table with extensive storage and an oversized map drawer and then aft is a 7' pilots berth and further aft the captain's cabin with double bed and short couch/bunk trimmed in plush fabrics. Across from Llyr's salon seating, convertible bunk and teak folding leaf table is a lovely stainless steel Dickinson Marine Antarctic Diesel Heater with a glass burner window (list$900); useful when sailing the US Northeast coast and it would serve well those headed for New Zealand. 3 double and one single. 2 X hot and cold showers. One in ensuite and one guests bathroom adjavent port side guest cabin. 2 X marine toilets. Holding tank is plumbed but was removed for aditional space. Can be re-installed very easily. Llyr carries an articulated 24" Asus HDMI VS24A monitor with 170 degree view angle (this screen is also backup for the navigation screen), and with Bluetooth. Refrigeration is provided by an Adler-Barbour Super Cold Machine that cools a heavy cold plate. Recent servicing includes a new cooling fan and diagnostic panel. The compressor has not needed recharge in seven years of operation. This year the owners have added an additional new Dometic freezer for deep cold storage of meats, etc. The Plastimo 3000 three burner stove and oven is gimballed and fiddled and draws from 2 external propane tanks. Water is stored in three stainless steel tanks below the soles and totals 1300 liters. The dual SS galley Scandvick sinks have three faucets to provide 1) 0.5 micron and carbon filtered water for drinking (Pentek CFB-PB10 Carbon/Fiber block cartridges), 2) direct hot & cold tank water and 3) sea water for washing. Storage for expeditionary foodstocks is extensive both in the galley and under the salon couches and three overhead food hammocks. The teak table has two leafs that fold down and is fiddled as are all counters. The cockpit also has a folding teak table and built in cooler storage. Along with a Magma Nestable 10-piece stainless steel cookware set, the ship has a small Cuisinart, silicone bread pans, and more kitchen implement. Counters and passage are thoughtfully designed for bracing and control when cooking in active seas. Primary anchor is a new technology Manson Supreme that, like a Rocna, does incredible work. Anchor rode includes 100 meters of G4 5/16 chain and 150 meters of G3 5/16 chain. There are 75', 150' and 250' 8 strand plaited nylon brait lines with stainless steel thimballs (17,000lb working load) along with new docking lines and snub lines with stainless snub- hooks and hardware and chafe gear. Also included is an emergency oxygen tank. 4 ways to pump bilge and seawater: 2 Jabsco 3000 Submersible Bilge Pumps on automatic in fore and aft bilges, 1 Whale Gusher 30 Manual Bilge Pump in the engine room, and a raw water Y-valve that converts the engine's raw water intake into an emergency bilge-pump. Stainless steel bars and locks for all lazarretts and SS hatch bars that prevent intrusion if you happen to anchor where night security is a concern. Research Vessel Llyr has shipwide dual 12v and 110V systems, wall plugs and charge ports all with breakers and fuses which, along with a Freedom 2000 watt inverter/charger are managed by a Heart Interface Link 2000-R controller/regulator that provides full digital volt/ amp & amp/hour charge information for two banks. Llyr's six Trojan T105 6v lead/acid house batteries (running parallel and in series) were replaced in 2014 and not allowed to drop charge below 12 volts; no exceptions. Total house capacity is 1350ah @ 20hrs (or 1110@ 5 hrs) Her large Caterpillar 1400 CCA engine/ backup battery was purchased in 2017 ($500usd). Ship's power and battery charging can be supplied three ways; 1) by shore power (galvanic isolator protected) using an on-board 220v to 110v transformer; 2) by the engines 100amp alternator (a new backup 100amp alternator is on-board) or; 3) by the ship's 2000watt Honda inverter generator's 110/12v output. The Heart-Interface system is a smart charger, monitors for reverse polarity and can equalize the batteries when needed to restore their storage capacity. On board is a new backup 1000watt inverter. All of the ship's lights, including interior, deck, navigation, steaming and anchor have been changed out for low draw LED's. Llyr carries a silver/silver chloride half cell anode tester that fits to a multi-meter and confirms the mild steel hull and her 22 zinc anodes at a stable. 8v is properly anode protected and carries no stray current, poor grounds or reverse polarity. Two years ago the owners replaced the vessel's NMEA183 network with a NMEA2000 network B&G Triton package. Plug and play components feeding the trunkline and two glass/ 4 color display screens, include Course, Radar, Depth & Speed Over Ground, GPS, True & Apparent Wind, Water Temp and AIS data. B&G TritonNMEA 2000 instrument system is both independent and can be run into any PC based system like Navionics or plug&play navigation system. There are two VHF radios; the Standard Horizon GX2100 Matrix provides received AIS data to the network and the ICOM IC-M504 is backup and connects to a remote handset in the external cockpit. An Amek NK80 translator converts AIS data to NMEA2000 format. An Actisense NGT-1USB converts NMEA2000 to USB format as Llyr's navigation is configured for PC and Coastal Explorer Navigation software. The receiving laptop computer lives below on the navigation table (with two additional Thinkpad computer backups) and projects image and mouse control through HDMI and USB to a 24" Asus Pro-Art Wide Color Gamut 1920x1200 full HD video format 1080p screen above at the interior navigation station. This large screen can configure multiple overlapping display panels as desired. Llyr's original 2kw Raytheon radar and cables were replaced 2011 with a Si-Tex, Koden 4kw unit (twice the range). The Koden antennae can see up to 36 miles. The unit is sophisticated and sensitive with numerous tracking features and filters. Coastal Explorer from Rosepoint Navigation is non-proprietary for maps-- owners use Italian C Maps and Google geo-referenced maps (Admiralty maps are another option). The software is agile and can overlay multiple data sources on different sub-screens on the monitor. The owners commonly overlay radar onto our route (+AIS) displayed on dual C-Maps and Geo- referenced Google Earth map screens giving them high mapping reliability and position confirmation. The computer handles all contemporary navigation, quilting and plotting tasks including speed and distance estimates to goal and displays a wide array of instrument options from AIS data to Apparent vs True Wind, heading, distance to goal etc. The BG Triton system further includes two independent glass, color display screens (one interior and one exterior) that are programmable with up to 8 data windows per screen including wind speeds, course, depth, boat speed etc. German dacron, Dimension Polyant (450ap & 410ap) that is heat sized, using hot rollers (no spray adhesives), to lock the warp and weft, and includes strong UV inhibitors. The fabric is stiff and remarkably slow to age. He added reinforcement after reinforcement at load points, and along seams used adhesive tapes alongside triple stitching in a dark brown decorative thread. He put extensive battens in the mizzen, main and staysail that flatten the sails and dramatically tighten Llyr's angle of attack to windward. If you come to Vuda Marina to inspect Llyr you will simply not see another stronger set of sails, all in excellent condition as the fabric is extremely resistant to wear and solar exposure. Full backup set of white traditional weight and cut sails, and a rubberized orange storm staysail, all in excellent condition and never used. They store forward in a generous chain locker along with a "Code Zero" or Universal Power Sail with an ATN sock and Spectra lines we acquired for deployment in light winds.